Let’s face it, red wine and sweat are the bane of stylish clothing. 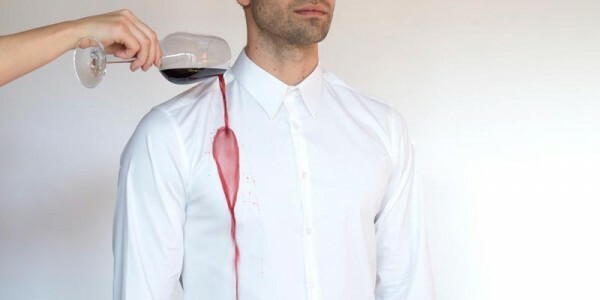 No matter how careful you try to be, you can only dodge wine stains for so long, and there’s really no escaping those yellowish sweat stains around the armpits. They’ll make you throw away an otherwise perfectly good shirt, but there’s really no other way around it. Or is there? 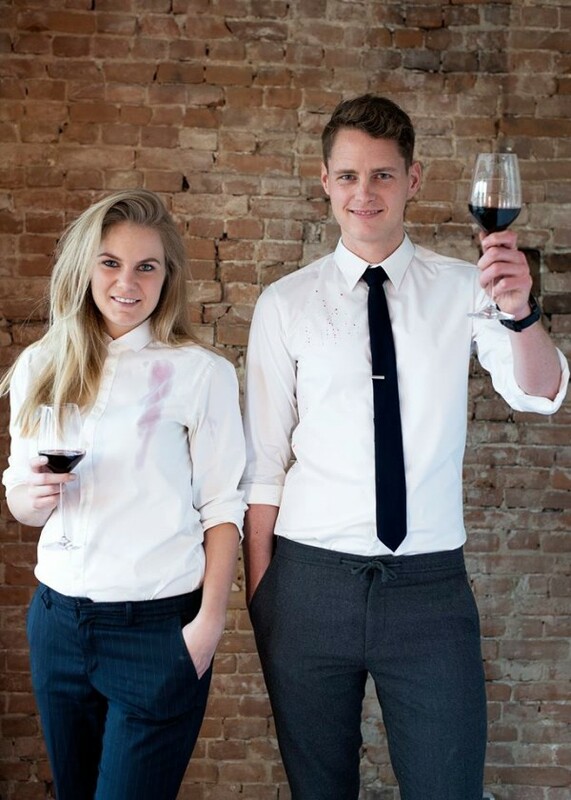 Amsterdam-based startup Labfresh claims to have come up with a range of cotton shirt and ties that make all sorts of problematic stains a non-issue. Not only that, but it supposedly prevents any smells from adhering to the fabric and is wrinkle resistant, requiring only minimal ironing. It sounds too good to be true, but Labfresh founders Kasper Brandi Petersen and Lotte Fink claim that their innovative INDUO technology can do all that and more, while preserving the cotton shirts’ natural feel. Before reaching out to the Kickstarter community in a crowdfunding campaign, Labfresh co-founder Kasper Brandi Petersen claims to have tested the effectiveness of their smart shirts personally. He has been running, biking and dancing in them for over 100 hours, and also exposed them to all kinds of tough liquids like red wine, sriracha sauce, olive oil and more. After washing the samples more than 40 times and confirmed the INDUO technology was still very effective, he knew they were on to something. Another thing that makes Labfresh cotton shirts different from other stain-resistant clothing is the fact that they are breathable. Instead of making them completely water proof, they chose to preserve the cotton’s natural properties, allowing the sweat to evaporate through the fabric, while leaving the body and the shirt relatively dry. However, Kasper guarantees that despite not being 100% waterproof, the shirt repels decent amounts of liquids and dries up extremely fast. 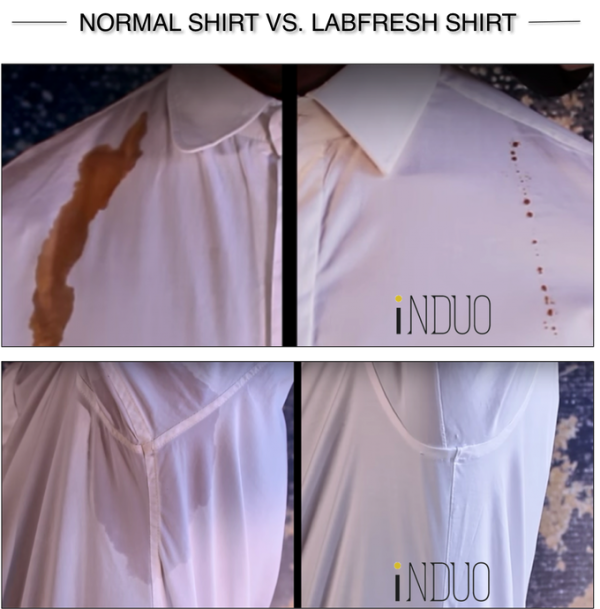 The INDUO technology ensures that the shirts remain fresh for considerably longer than regular cotton shirts, but the number of days they can be worn ultimately depends on the person wearing them. The smart textile also make the cotton shirts wrinkle resistant, and while Labfresh does recommend ironing after every wash for a perfectly crisp look, tough wrinkles will never be a problem. Labfresh shirts are made up of 98% INDUO cotton and 2% elastane, for maximum comfort. While the company is currently only offering shirts and ties, following the success of their Kickstarter campaign – they’ve raised over €47,000 in just 8 days – they are looking into creating a whole range of stain and odour-resistant clothing. Labfresh smart cotton shirts are priced at €119, but if you pledge to their crowdfunding campaign you can preorder them with a €20 discount.